Maryam Azam spent most of her teenage years living in Blacktown. She completed a Bachelor of Arts (Deans Scholars) from the University of Western Sydney, and graduated with Honours in Creative Writing in 2013. She also holds a diploma in the Islamic Sciences. Maryam is a primary school teacher in Kellyville and writes across the genres with a special interest in poetry. 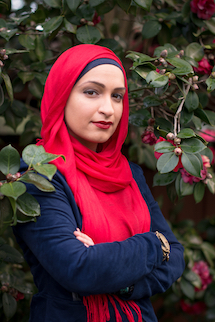 Maryam was the 2015 recipient of a WestWords, Copyright Agency Emerging Writers’ Fellowship, and has presented her work at a number of WestWords’ events as well as at Sydney Writers’ Festival. In May 2018, her debut poetry collection The Hijab Files was published by Giramondo.